Why is a clear vision statement critical to the success of your organisation? And how do you ensure that message is consistently communicated throughout your business? 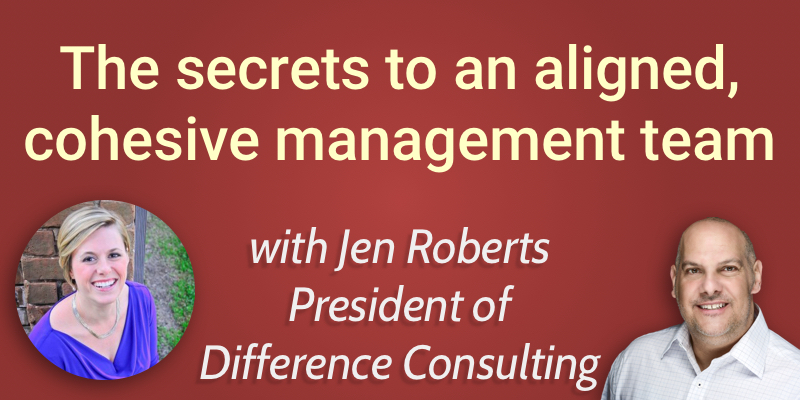 Today we speak with Jen Roberts of Difference Consulting about the importance of cohesive alignment within your management team and what you can do to engender engagement within the workforce. What causes the disconnect between business leaders and their management teams? What are some of the problems we can expect to encounter when the relationship between the business leader and the management team is out of alignment? How important is it to create a common vision to the success of what you’re trying to accomplish? How can you determine whether your management team is aligned with your vision? When we think about our responsibility as leaders within our organisations, it’s paramount that we make every effort to ensure that we have a cohesive alignment with members of our own management team. When I go into organisations, one of the biggest problems that I find is that there is a disconnect between the top leader and members of his own leadership team. And one of the things that I try to help them with, is how does this disconnect happen and what are the secrets of developing a progressive alignment with members of your team. Today’s guest is going to give us those secrets that will make this alignment and develop this cohesive team. Jen Roberts is the president and founder of Difference Consulting, a company specializing in helping companies build, develop and leverage the unique talents of their own people and teams internally through strategic consulting, executive coaching and proprietary leadership development programs. She is a member of the Forbes Coaches Council, an accomplished author, and you can read her stuff on such websites as Forbes and the Association for Talent Development. Leaders want to have clear strategic alignment with their management teams to drive workplace culture and productivity. But so many of these teams struggle with making that alignment a reality. One of the big reasons that that happens, says Jen, is the message not being communicated correctly. Often leaders feel that they are communicating their message and key visions of the organisation clearly, but in fact they are not always interpreted by the team as intended or flowing from one team member to the other as you had imagined. This can be a particular challenge for leaders that have been in the position for a long time with the same management team – the assumption often is that everybody is on the same page, but in actuality this might not be true. And this can start a domino effect throughout the entire workforce, affecting their engagement, satisfaction and productivity. When a management team is aligned in terms of their communication and their decision making processes, is modelling the core values of the company and working towards a common vision and purpose, it is a beautiful thing. It leads to greater trust, respect, and productivity within the team. So when they are not aligned, all sorts of problems can occur. One of the biggest issues initially is that it creates confusion amongst the ranks in the organisation. When an employee goes to any member of the management team they expect to get consistent information regardless of who they approach. And when a management team isn’t aligned, it creates a lot of confusion for those employees when they get different answers or directives. This can actually paralyse the productivity of the organisation because people don’t know what to do and don’t want to make mistakes – and as a result can end up not working as effectively as they could. Or worse yet – not do anything! It can also result in a lot of unnecessary work on the part of the employees as they might be duplicating the efforts of others on the team. Or they may have to do something again as it wasn’t aligned with what the leader was expecting – a cause of frustration and disengagement with employees and the management team, effecting moral across the board. In fact, Gallup reports that almost 71% of our workforce are either disengaged or actively disengaged. As a leader you want to create an environment where people feel like they are contributing meaningful work, tied to a common purpose. So a cohesive, aligned message throughout the organisation is critical to creating and maintaining and engaged, satisfied workforce. Another issue that can arise over time is damage to the credibility of the management team or even the leader themselves. When decisions are overturned or questioned by members of the team, it can lead to a lack of trust in the management by the workforce as a whole. As leaders we want to be able to create organisations where we’re motivating and inspiring employees that leads to the trust and collaboration that produces the best results. Skipping over key steps that will help leaders create better alignment within their teams to build that trusting and respectful organisation can become very damaging. Creating that common core value and mission is absolutely critical to the success of any organisation. Building buy-in to this common vision or purpose is one of the steps leaders can take to build better alignment within their management team. It’s surprising how many organisations operate without a central focus. It’s important to review the vision statement with the management team and if nothing exists, take the time to co-create that vision with the leaders within your organisation. In order to be engaged, employees need to be able to understand how what they do on a daily basis contributes to the overall strategic objectives of the company. If you don’t know what your vision statement is – throw it away. And then invite people to the table, create a new one and then build a campaign around that vision and watch the success happen. Communicating with your team is absolutely critical. Keeping open lines of communication with the management team, building buy-in to changes and decisions within the business, ensures that the message is clearly and consistently filtered down through the organisation. Transparency in communication with the entire workforce is important to ensure that the whole organisation continues to understand how their work impacts the overall company vision. And more importantly, that you’re honoring them. When you’re gaining that alignment with your management team, it’s about agreeing on what is their decision space? What is the authority that they have the ability to make decisions around? What are the clear channels of communication that are important to define within your organization? Being clear on these parameters avoids confusion and risking undermining the authority of the managers within the team. It allows you to trust your managers’ decisions, but it also engenders greater respect and provides consistency to all your employees regardless of the management level that they approach. It’s also very important, through the open channels of communication that have been established, to ensure managers have a greater sense awareness of not only their own responsibilities, but also those of others, and building shared alignment and agreement to the decision space collectively as a team. Gathering your management team and asking them if they know what the vision statement is. Seeing where people are in their own interpretation of the company’s vision and mission gives you the opportunity to see if there is a misalignment. If that is the case, you can seek support from consultants such as Jen and her team to help your management team reach greater alignment and create new statements that more accurately support the culture that you’re trying to drive within your organisation.